They say lightning never strikes twice, but that is a myth. It doesn't happen often, lightening usually gets it right the first time. When you're hit with 30,000 amps of electricity you feel it. It can make you forget who you are. It can burn you, blind you, stop your heart. And cause massive internal injuries. But, for something that happens in only a millisecond, it can change your life forever. 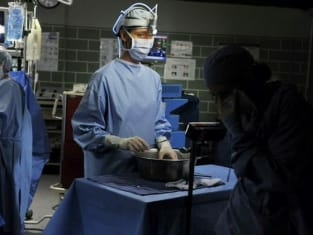 Grey's Anatomy Round Table: "Shock to the System"
Grey's Anatomy Review: "Shock to the System"